Are you ready for something a little different? I’m sure you’ve probably heard of finger knitting and arm knitting; they’ve gotten pretty popular over the last year. So I thought, why not finger crochet? I went to my local craft store, picked up a few skeins of the chunkiest yarn I could find and rushed home to see if it were even possible. Not only was I shocked by how easy it is, I was completely surprised by how amazing it looks! Just look at that texture! The yarn definitely deserve some credit but I just can’t get over how neat finger crochet works up. The beautiful yarn I used is Lion Brand Quickie in the colorway called “tangy”. The colors remind me of a painting and believe me, it is as soft and squishy as it looks. Finger Crocheting is a really quick and easy technique if you’re looking for a little diversity in your craft. 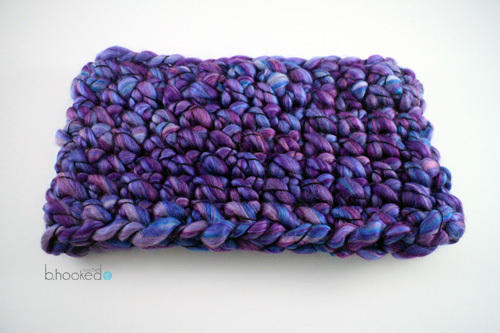 It works best with super bulky yarn or wool roving. There are no special skills needed; anybody can finger crochet! Of course being familiar with crochet will make it easier but even if you’ve never picked up a hook you can follow along with my tutorial and finish this cowl in under 30 minutes. 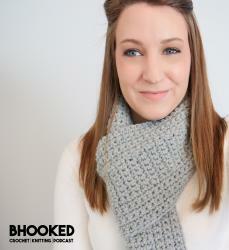 Need a cowl for a party tonight? Finger crochet! Need a fun craft to share with your kids? Finger crochet! Need to rest your hook hand for a bit but still need to create? Finger crochet! Adult Size: The adult size cowl measures approximately 14″ wide and 7″ tall when laying flat. The circumference measures approximately 26″. Child Size: The child size cowl measures approximtaely 8.5″ wide and 5.5″ tall when laying flat. The circumference measures approximately 14.5″. 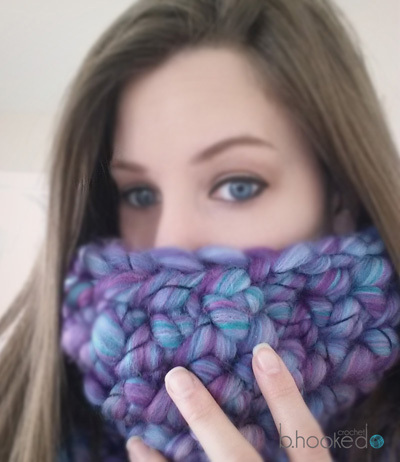 The finished size of your cowl depends greatly on the size of your hands. This is because your fingers control the gauge of the stitches. Consider this tutorial and pattern as more of a guideline. Once you create your initial chain, make sure it is the proper size before proceeding. You may add chains or use fewer based on your needs. No matter what number of chains you begin with, the method of finger crocheting will be exactly the same as in this video. Please keep in mind that if you use more chains/stitches, you will need slightly more yarn than the recommendation. The amount will depend on the size difference and you may have to make some estimations. Round 1: Loosely chain 12. Join with a slst to the first chain to form a ring. Ch 1. Rounds 3-6: Working in a spiral fashion, make one sc in every stitch. Once you have completed round 6, make 2 slst and bind off. Round 1: Loosely chain 25. Join with a slst to the first chain to form a ring. Ch 1. Rounds 3-7: Working in a spiral fashion, make one sc in every stitch. Once you have completed round 7, make 2 slst and bind off. How can I subscribe to new patterns? Thank you so much! You can subscribe to receive an email whenever something new is published – this includes all post types (patterns, stitches, techniques, blog posts, podcast episodes…) You can find that form about halfway down the main page http://www.bhookedcrochet.com (on desktop version) or down to the bottom of your mobile device. Lovely cowl!! This is how my aunt taught me to crochet before she gave me a hook!!!! I’ve enjoyed crocheting ever since!! !